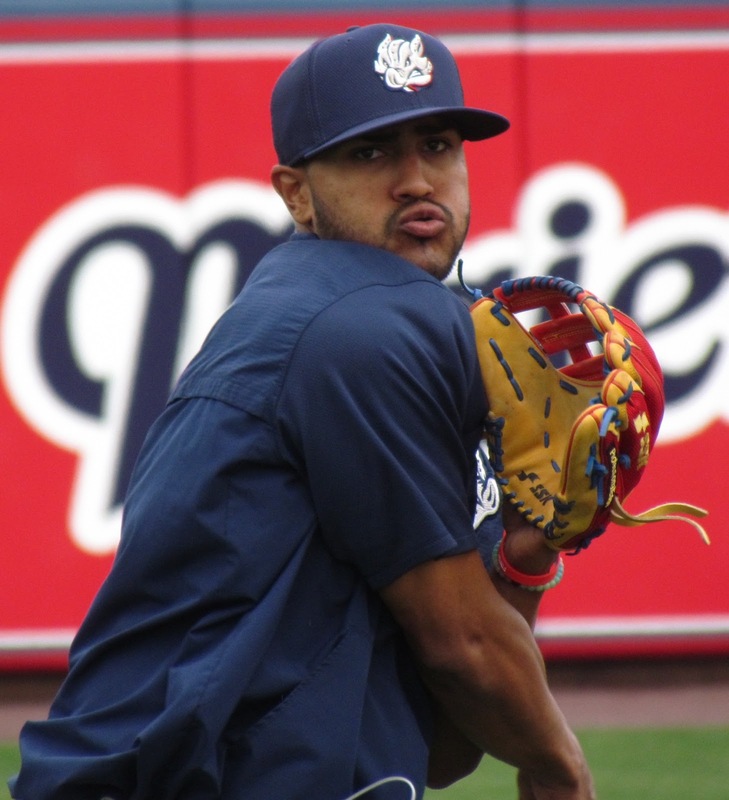 Following an outstanding spring campaign with the Phillies last year, Jesmuel Valentin was a big part of playoff bound Lehigh Valley IronPigs lineup, but an injury shortened his season. Following a considerable stretch on the shelf, the 23-year-old switch-hitter is nearing a return to the diamond. In 21 Grapefruit League games last spring, the former supplementary round draft pick (51st overall, 2012) by the Dodgers, who was acquired by the Phillies in the 2014 Roberto Hernandez trade, sported a .366 batting average with six doubles and four RBI. He opened the season as a member of the Triple-A IronPigs, where he tallied a .229 average with a home run and seven RBI in 29 games before injuring his shoulder on a diving play in an extra-inning affair on May 12th. A native of Puerto Rico, Valentin's off-season has not only been filly with recovery for his injured shoulder, but recovery for his friends and loved ones as well, following the impact of Hurricane Maria. The son of former big leaguer Jose Valentin, Jesmuel is hoping to get cleared to play in Roberto Clemente League in Puerto Rico once their storm-shortened season gets underway in January. Recently, I talked with Jesmuel about his off-season, his impending return to action, the recovery process in Puerto Rico and some exciting personal news. Read ahead for that full interview. -How is the recovery with your shoulder? Which one is it? And what is your rehab routine like these days? My shoulder feels amazing, I will say is at 95 percent and it's my left shoulder. I'm at Clearwater right now. I'm leaving on Thursday to Philly to see Dr. Cowen and take the last test to see how everything's going. Hopefully, I can get cleared so I can play winter ball and get those at bats I lost this year and get back on track. Most of my rehab has been in Clearwater with the trainers Joe Rauch and Justin, but also have been back home helping my family out and working out with my dad and trainer Josue Lionel on new exercises and mobility to get the small muscles stronger and prevent any other injuries. -Are there any teammates you've spent time working with during your rehab? No other teammates, but a couple friends from hometown that they are also professionals, like Ivan de Jesus Jr., Jose Berrios and Neftali Soto. -How disappointing was it to miss out on much of this year's exciting IronPigs season? It was very disappointing not only 'cause it was a huge year overall for every one of my teammates, but also I felt this was the year that my dream (of reaching the big leagues) was going to come true, it was a really good off-season and Spring Training. Started the season really hot then a couple bad weeks but I was already making adjustments when I got injured. -You and I swapped messages recently and you mentioned working on being a dad. I think that means you're expecting a new addition to your family. Congratulations! Yeah, God gave us an early Christmas present letting my fiancée Nashalie and I know we are going to be parents. If everything goes well we are supposed to see our little baby on June 20, early or later. My family is really happy and pumped. Everybody is anxious to know the gender. -What is your hometown and what has recovery been like since the hurricane that caused so much damage? I'm From Manati, Puerto Rico, 40 Minutes from the Capital. It was destroyed. Never seen something like that before. No gas, no water, no food, no groceries. It was tough, but thank God for the past month everything has been back to normal and people are starting to receive help and get everything that they lost. -In the news I hear conflicting reports about how much power has been restored. Do you know people that are still struggling with lack of power or services? Right now our hometown has power but sometimes will go for hours or two days and then comes back. Water is the same, with signal is a struggle. Some days works out perfectly, then others there's no signal. -Did the Phillies reach out to you to check on you and your family following the hurricane? The Phillies organization, right after the hurricane, they were calling to check on me and my family. They were always there, asking if everything was okay and making sure if we needed something so they can help. -Is there any silver lining or big lesson you've learned during the time sidelined that you would want to share? Not really. It just was a hard time for me and my family. We felt this past year was the one for us, but it has been a learning process and getting the positive side of it. We have worked more than normal to better in everything; mobility, agility, strength, conditioning, spiritually and focusing. My trainer, Josue Lionel, and I have a nice connection we have been together three years and I have learned a lot of different thing. I not only lift weights and go to the park, we spend four to five hours in the gym working on different aspects, so we can learn how our body moves, reacts and recovers. We have a nutrition also that is the most important thing for me. Without that there's no point of training, because you need to eat the right food and condiments so your body can react the right way. Also he has been the person besides my Grandma to show me how big and special God is.